Mommies, winter vacation is coming, if it hasn’t begun already for some. This month we are bringing you some ideas to keep the littles busy during their vacation with fun holiday ornaments for them to create. My daughter and I have been making Christmas ornaments together for several years and she passes them out as gifts. This is really easy for little kids. Using Popsicle sticks, stack each one onto one another and either hot glue them together so you can start decorating right away or use wood glue if the child wants to do it themselves. Your child will love decorating and creating their own personalized snowflake. Puffy paint, gems, beads, and markers all make great decorating tools. You can use yarn, string, or pipe cleaners to attach to the top to hang from the tree. Use a long strip of ribbon and hot glue the bottle caps to it. Fold the extra ribbon and glue to make your top loop. Then hot glue on the back for the arms. Then, time to decorate! Use puffy paint or sharpies for the faces. Little twigs or the thin craft rope make great arms. Use your child’s handprint to create a snowman family. 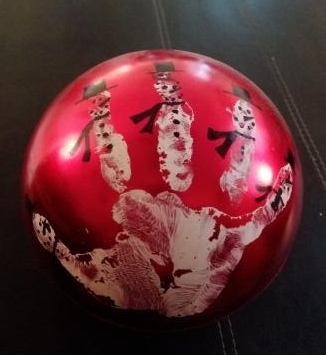 Paint your child’s hand and place the ball into the palm of their hand and have them gently bring their fingers up to hold the ornament. Gently have them release their hand and pull the ornament off. Then decorate! Painting your child’s hand instead of dipping it into the paint helps make the print more visible and dries faster. Metallic sharpies show better on the ornaments. For older children, you can find the big oversized balls so their hand fits better onto the ornament. Using puffy paint and decorative ribbons, gems, bells or anything else lying around the house decorate snowmen onto the ornament. This batch my daughter made was for her teachers at school and she added music notes for her music teacher, basket balls for her gym teacher, etc. to give them a personal touch. Cut out a snowman out of a piece of thin cardboard to trace the snowman onto the ornament. Use ribbon and attach name tags to the top of the ball, because we know an elf always steals the medal hooks from the Christmas box every year! Use an egg carton for their work in progress to they don’t roll all over the place.